There are a number of human foods that you should avoid feeding to dogs as they can have an adverse effect on their health. Alcohol: affects dogs in the same way it affects humans. High levels of alcohol consumption can cause intoxication, gastrointestinal irritation, respiratory distress, coma and death. Avocado: contains persin which is in all parts of the avocado. Ingestion causes gastrointestinal irritation, vomiting, diarrhoea, respiratory distress, congestion, fluid accumulation around the tissues of the heart and even death. Chocolate: contains theobromine (a methlyzanthine) which is toxic to dogs. Toxicity is dose related meaning that the overall effect of chocolate ingestions depends on the size of the dog, the amount eaten and the type of chocolate. Symptoms include restlessness, excitement, hyperactivity, nervousness, trembling, vomiting, diarrhoea, increased drinking and urination, increased heart rate and seizures. Note that darker chocolate is more dangerous than milk chocolate. White chocolate has the lowest level of methylxanthines, while baking chocolate contains the highest. Coffee or caffeine products: In large enough doses, caffeine can be fatal for a dog and there is no antidote. Symptoms of caffeine poisoning include restlessness, rapid breathing, heart palpitations and muscle tremors. This also includes tea. 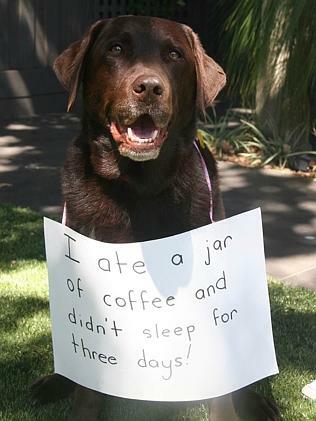 MOLLY, the beloved chocolate Labrador (maybe she should be called Mocha) scoffed an entire jar of coffee and didn’t sleep for three nights. Cooked bones: can splinter and cause gastrointestinal obstruction or laceration. Fat trimmings: Fat, both cooked and uncooked, can cause intestinal upset, with vomiting and diarrhoea. 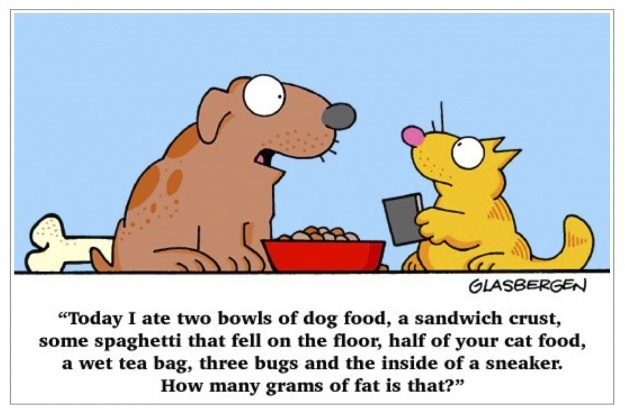 It can also lead to your pet to developing pancreatitis. Grapes, Raisins, Sultanas & Currants: The toxic substance within grapes and raisins is unknown but it can lead to kidney failure. Onions, Garlic & Chives: These contain a substance that can cause gastrointestinal irritation and lead to red blood cell damage and a form of anaemia. Garlic and chives contain the same substance but at a lesser volume. Salt: Large amounts of salt can produce excessive thirst and urination, or even sodium ion poisoning. Signs that your dog may have eaten too many salty foods include depression, tremors, elevated body temperature and seizures. Tomatoes and Potatoes: These contain a substance that causes violent gastro-intestinal problems. Xylitol (Artificial Sweetener): Causes insulin release in dogs which can lead to liver failure. Initial signs of toxicity include vomiting, lethargy and loss of coordination. This sweetener is used in candy, gum, toothpaste, baked goods and some diet foods. Yeast dough: can rise and cause gas to accumulate in your dog's digestive system. This can be painful and cause the stomach or intestines to rupture. The risk diminishes after the dough is cooked and the yeast has fully risen. Not all fruits and veggies are good for dogs but carrots are! 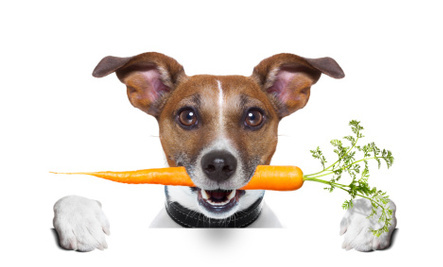 Carrots are a great source of beta-carotene for dogs. While many dogs love to just chew on carrots, it’s easier on their digestion if they eat shredded carrots instead of chunks. I have Labs and they think shredded carrots are a treat that they work for. But, if yours won’t eat it directly from your hand, you can take a handful of shredded carrots and sprinkle it on their kibble. This is my first look on your writing and I am glad to know your concept about the dog and I hope this http://dogsaholic.com/care/dog-trembling.html also able to help us more about our dog.